When it comes to the first galaxies, the James Webb Space Telescope will attempt to understand the formation of those galaxies and their link to the underlying dark matter. In case you didn’t know, most of the matter in our universe is invisible (a.k.a. “dark”), but its gravity binds everything together, including galaxies. So by studying galaxies – and especially their formation – we can get some hints as to how dark matter works. At least, that’s the hope. It turns out that astronomy is a little bit more complicated than that, and one of the major things we have to deal with when studying these distant galaxies is dust. A lot of dust. That’s right: good old-fashioned dust. And thanks to some fancy simulations, we’re beginning to clear up the picture. 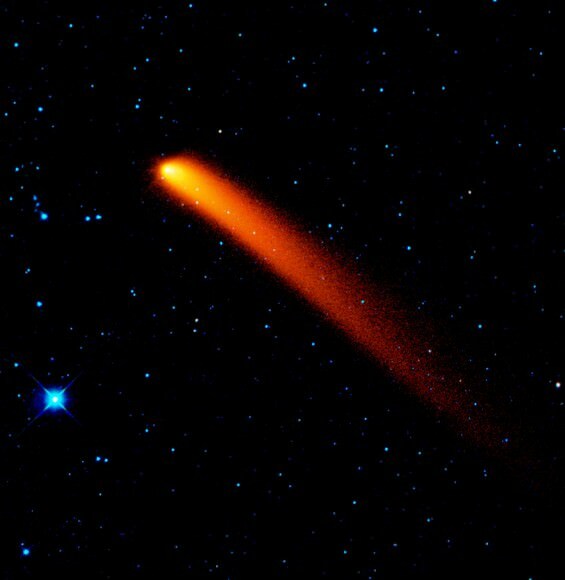 Do Comets Explain Mystery Star’s Bizarre Behavior? 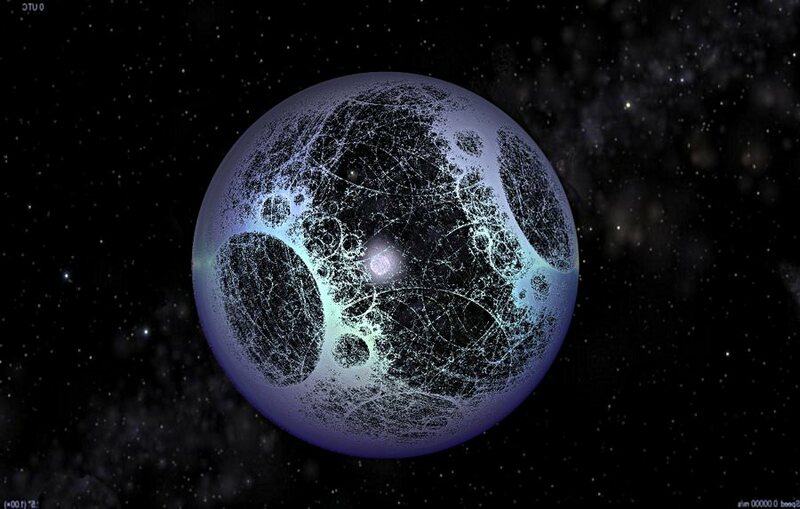 The story of KIC 8462852 appears far from over. You’ll recall NASA’s Kepler mission had monitored the star for four years, observing two unusual incidents, in 2011 and 2013, when its light dimmed in dramatic, never-before-seen ways. Models to explain its erratic behavior were so lacking that some considered the possibility that alien megastructures built to capture sunlight around the host star (think Dyson Spheres) might be the cause. But a search using the SETI Institute’s Allen Telescope Array for two weeks in October detected no significant radio signals or other signs of intelligent life emanating from the star’s vicinity. Something had passed in front of the star and blocked its light, but what? Shattered comets and asteroids were also suggested as possible explanations — dust and ground-up rock would be at the right temperature to glow in the infrared — but Kepler could only observe in visible light where any debris would be invisible or swamped by the light of the star. So researchers looked through older observations made in 2010 by the Wide Field Infrared Survey Explorer (WISE) space telescope. Unfortunately, WISE observed the star before the strange variations were seen and therefore before any putative dust-busting collisions. 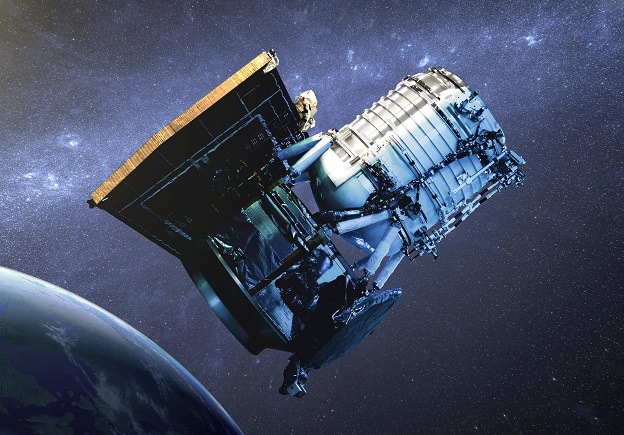 Not to be stymied, astronomers next checked out the data from NASA’s Spitzer Space Telescope, which like WISE, is optimized for infrared light. Spitzer just happened to observe KIC 8462852 much more recently in 2015. “Spitzer has observed all of the hundreds of thousands of stars where Kepler hunted for planets, in the hope of finding infrared emission from circumstellar dust,” said Michael Werner, the Spitzer project scientist and the lead investigator of that particular Spitzer/Kepler observing program. I’d love to report that Spitzer tracked down glowing dust but no, it also came up empty-handed. This makes the idea of an asteroidal smash-up very unlikely, but not one involving comets according to Massimo Marengo of Iowa State University (Ames) who led the new study. Marengo proposes that cold comets are responsible. Picture a family of comets traveling on a very long, eccentric orbit around the star with a very large comet at the head of the pack responsible for the big fading seen by Kepler in 2011. Later, in 2013, the rest of the comet family, a band of various-sized fragments lagging behind, would have passed in front of the star and again blocked its light. By 2015, the comets would have moved even farther away on their long orbital journey, leaving no detectable infrared excess. Clearly, more long-term observations are needed. And frankly, I’m still puzzled why cold or less active comets might still not be detected by their glowing dust. But let’s assume for a moment the the comet idea is correct. If so, we should expect to see similar dips in KIC 8462852’s light as the comet swarm swings around again. Astronomers have been arguing over just how many spiral arms our Galaxy exhibits. Is the Milky Way a four or two-armed spiral galaxy? Astronomers had often assumed the Milky Way was potentially a four-armed spiral galaxy, but comparatively recent observations from NASA’s Spitzer telescope implied the Galaxy had two spiral arms. In 2013, astronomers mapped star forming regions and argued they had found the two missing arms, bringing the total number of arms back to four. The case for a four-armed Milky Way may have just gotten stronger. A team of Brazilian astronomers used star clusters embedded in their natal clouds to trace the Galaxy’s structure. “Our results favour a four-armed spiral Galaxy, which includes the Sagittarius-Carina, Perseus, and Outer arms.”, remarked the group from the Universidade Federal do Rio Grande do Sul. Spiral map of the Galaxy by Urquhart et al. 2013 (image credit: Urquhart et al. 2013, R. Hurt, the Spitzer Science Center, R. Benjamin). “Despite efforts aimed at improving our understanding of the Galaxy’s structure, questions remain. There is no consensus regarding the number and shape of the Galaxy’s spiral arms.”, noted lead author D. Camargo. He added that the Sun’s location within the obscured disc of the Galaxy was a principal factor hindering our understanding of the Milky Way’s broader structure. In other words, we do not have a bird’s eye view of our Galaxy. The team remarked that young embedded clusters are excellent tracers of the Galaxy’s structure, “The present results indicate that the Galaxy’s embedded clusters are predominantly located in the spiral arms.” They noted that star formation may occur after the collapse and fragmentation of giant molecular clouds found within spiral arms, and consequently the young embedded star clusters that subsequently emerge are excellent probes of Galactic structure as they have not displaced far from their birthplace. A projected face-on view of the distribution of embedded star clusters studied by Camargo et al. 2015. The objects appear to lie on the Sagittarius-Carina spiral arm, Perseus arm, and potentially an extension of the Outer arm (image credit: Camargo et al. 2015). The team used data from NASA’s WISE infrared telescope to identify young clusters still embedded in their natal clouds, which are often encompassed by significant dust. Infrared stellar light is less obscured by dust than visible light, giving the astronomers an unprecedented view. 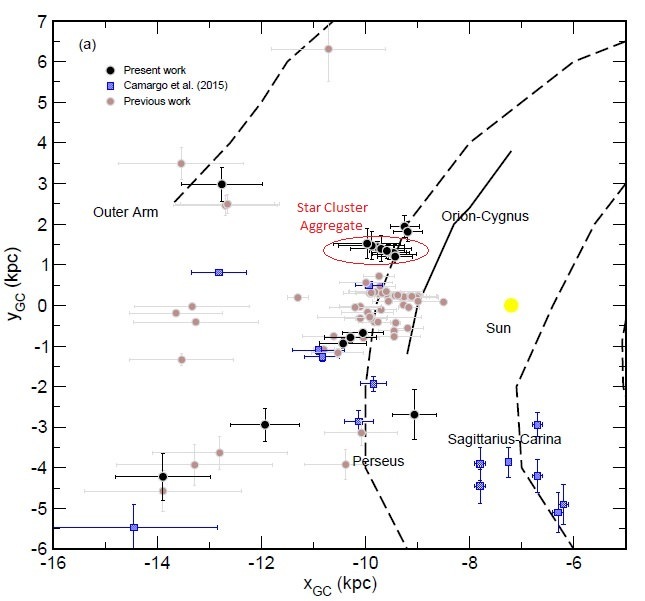 Indeed, the group discovered 7 new embedded clusters, several of which (designated Camargo 441-444) may belong to a larger aggregate that resides in the Perseus arm. 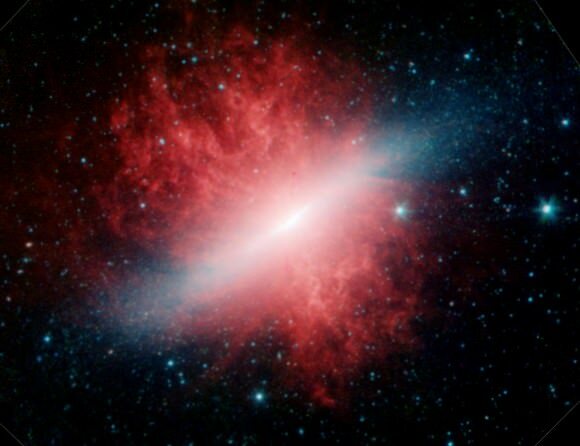 They suggested that a giant molecular cloud was compressed by the spiral arm which may have triggered star formation in several clumps, and numerous star clusters with similar ages emerged (an alternative or concurrent scenario is sequential formation). Astronomer A. Mainzer discusses NASA’s WISE telescope (Wide-Field Infrared Survey Explorer), which was used by Camargo et al. 2015 to identify embedded star clusters. The team also used near-infrared data from the 2MASS survey to determine distances for the star clusters, once the objects were identified in the WISE images. A primary goal of their work was to establish accurate fundamental cluster parameters, which would bolster any resulting conclusions concerning the Galaxy’s overall structure. An innovative algorithm was therefore adopted to minimize contamination by foreground and background stars along the sight-line, which may otherwise appear as cluster members and degrade the reliability of any distant estimates. “The embedded clusters in the present sample are distributed along the Sagittarius-Carina, Perseus, and Outer arms.”, concluded the team. They likewise noted that the search for new embedded clusters throughout the entire Galaxy must continue unabated, since such targets may foster our understanding of the Galaxy’s structure. The discoveries are described in a new study by D. Camargo, C. Bonatto, and E. Bica that is entitled “Tracing the Galactic spiral structure with embedded clusters”. The research has been accepted for publication, and will appear in a forthcoming issue of the Monthly Notices of the Royal Astronomical Society (MNRAS). A preprint of the work is available on arXiv. It’s hard to believe it now looking at Mars’ dusty, dessicated landscape that it once possessed a vast ocean. 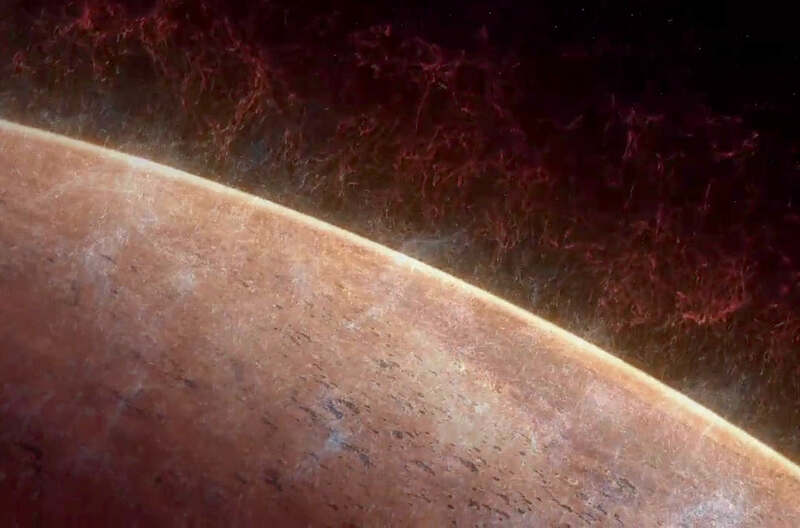 A recent NASA study of the Red Planet using the world’s most powerful infrared telescopes clearly indicate a planet that sustained a body of water larger than the Earth’s Arctic Ocean. If spread evenly across the Martian globe, it would have covered the entire surface to a depth of about 450 feet (137 meters). More likely, the water pooled into the low-lying plains that cover much of Mars’ northern hemisphere. In some places, it would have been nearly a mile (1.6 km) deep. Now here’s the good part. Before taking flight molecule-by-molecule into space, waves lapped the desert shores for more than 1.5 billion years – longer than the time life needed to develop on Earth. By implication, life had enough time to get kickstarted on Mars, too. Using the three most powerful infrared telescopes on Earth – the W. M. Keck Observatory in Hawaii, the ESO’s Very Large Telescope and NASA’s Infrared Telescope Facility – scientists at NASA’s Goddard Space Flight Center studied water molecules in the Martian atmosphere. 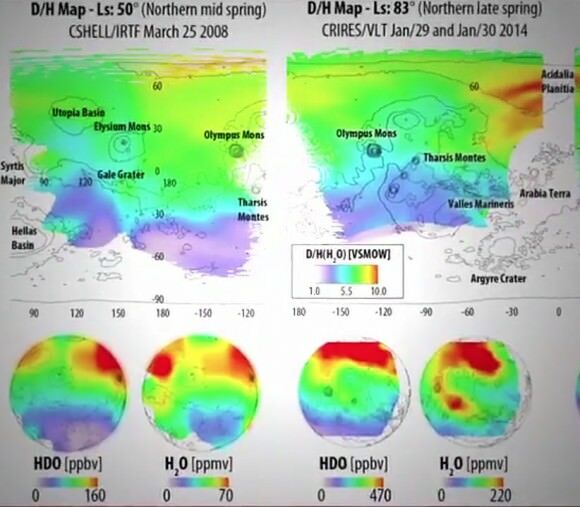 The maps they created show the distribution and amount of two types of water – the normal H2O version we use in our coffee and HDO or heavy water, rare on Earth but not so much on Mars as it turns out. In heavy water, one of the hydrogen atoms contains a neutron in addition to its lone proton, forming an isotope of hydrogen called deuterium. Because deuterium is more massive than regular hydrogen, heavy water really is heavier than normal water just as its name implies. The new “water maps” showed how the ratio of normal to heavy water varied across the planet according to location and season. Remarkably, the new data show the polar caps, where much of Mars’ current-day water is concentrated, are highly enriched in deuterium. On Earth, the ratio of deuterium to normal hydrogen in water is 1 to 3,200, but at the Mars polar caps it’s 1 to 400. 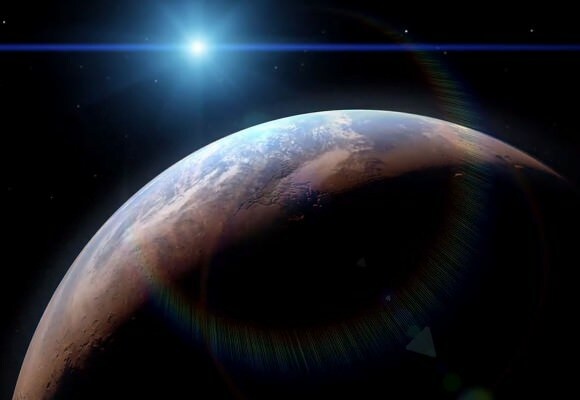 Normal, lighter hydrogen is slowly lost to space once a small planet has lost its protective atmosphere envelope, concentrating the heavier form of hydrogen. Once scientists knew the deuterium to normal hydrogen ratio, they could directly determine how much water Mars must have had when it was young. The answer is A LOT! Only 13% of the original water remains on the planet, locked up primarily in the polar regions, while 87% of the original ocean has been lost to space. The most likely place for the ocean would have been the northern plains, a vast, low-elevation region ideal for cupping huge quantities of water. 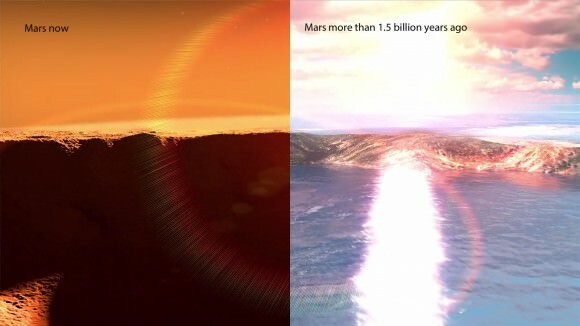 Mars would have been a much more earth-like planet back then with a thicker atmosphere, providing the necessary pressure, and warmer climate to sustain the ocean below. What’s most exciting about the findings is that Mars would have stayed wet much longer than originally thought. We know from measurements made by the Curiosity Rover that water flowed on the planet for 1.5 billion years after its formation. But the new study shows that the Mars sloshed with the stuff much longer. Given that the first evidence for life on Earth goes back to 3.5 billion years ago – just a billion years after the planet’s formation – Mars may have had time enough for the evolution of life. So while we might bemoan the loss of so wonderful a thing as an ocean, we’re left with the tantalizing possibility that it was around long enough to give rise to that most precious of the universe’s creations – life. To quote Charles Darwin: “… from so simple a beginning endless forms most beautiful and most wonderful have been, and are being, evolved.